FORT CARSON, Colo. — Soldiers from the 4th Infantry Division here recently made a big difference in the life of a young boy who is losing his eyesight. Carson Raulerson, an 11 year old from DeLand, Florida, was born with Knobloch Syndrome, a rare progressive degenerative disease that causes most people with it to lose their eyesight before they turn 20. Carson is severely nearsighted in his right eye and nearly blind in his left. He has undergone surgical procedures to preserve his vision since he was two, however, these procedures prevent him from doing the “normal rough and tough kid stuff” said his mother, Tara Cervantes. “We are trying to make as many visual memories while we can, because no matter what happens, he will get to keep those forever,” she said. The young Carson is named after Army Brig. Gen. Kit Carson, a legendary scout and frontiersman, which the Mountain Post derives its name, and a necessary stop along the family’s journey to preserve visual memories for Carson as his eyesight deteriorates. Carson was accompanied on his journey to the post by his older brother, Garrett Raulerson, their mother, and family friend Ted Snyder, a former 1st Battalion, 12th Infantry Regiment soldier who helped to arrange the visit. Together, the group met with 2nd Infantry Brigade Combat Team rear detachment commander, Army Lt. Col. Larry Workman, and senior enlisted advisor, Army Command Sgt. Maj. Perlandus Hughes. The two welcomed the group to the installation and started their day by outfitting the two boys with some Army “swag” to help them experience the day as soldiers. Workman shared with Carson how important it is to take care of all American families, and how the 4th Inf. Division was honored to host his family along their journey. The next stop on the group’s journey was the 4th Squadron, 10th Cavalry Regiment, where Carson was able to explore an M1 Abrams main battle tank and an M2 Bradley Fighting Vehicle. Carson and his brother learned about the vehicles’ capabilities and weapon systems. The unit’s soldiers explained how their individual roles as crewmembers contributed to the overall operation of a tank or Bradley. At the end of this stop, Carson was presented with a set of spurs and a certificate. “You receive spurs once you are an experienced cavalry member and pass certain tests. So today, after seeing you spend some time with the Bradley and the tank, I’d say you’ve earned them”, said Army Capt. Bret Wilbanks, commander of Delta Troop, 4th Squadron, 10th Cavalry Regiment. 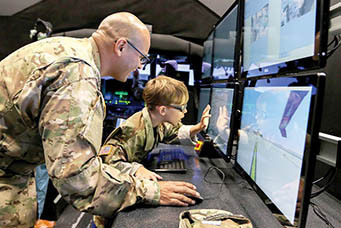 Next on their itinerary was a stop at a 4th Combat Aviation Brigade hangar, where Carson, via a flight simulator, communicated with a pilot conducting clearance procedures and landing drills. After conducting a touch-and-go drill, the pilot asked Carson how he did. “I don’t know. I think you better try that again,” Carson joked. The team from 4th CAB provided Carson and his brother with patches and coins to serve as memorabilia, as well as to communicate the belonging and accomplishment associated with being a member of a military unit. “[The simulator experience] was probably the one he was most comfortable with because computers and video games have digital screens and are where his visual impairments are least restrictive,” Cervantes said. Before departing for the day, the soldiers of the 4th CAB presented Carson with a pair of pilot wings to pin on his uniform top and thanked him for his hard work. “It really lifted him up outside of his circumstances and helped him reconnect with himself outside of what’s going on with his eyes, and to understand that he too can do big things if he applies himself,” Cervantes said. The division also provided Carter with an audio recording of his visit to further aid his memories in the future. “I’m proud of the treatment my Army family extended to an old friend who knew nothing about the Army. [Carson’s mom] now understands why I served for 24 years and understands that the saying, ‘We fight for the men around us, more than a cause,’ is not a cliche,” Snyder said.